Chancellor's Blog: Congratulations to one of our best! I was delighted to participate in the investiture ceremony of UIS Business Dean RonMcNeil as the PNC Distinguished Professor in Banking and Finance. In the world of higher education, being appointed to a distinguished professorship is a high honor indeed and this one was most certainly well-deserved. Dr. McNeil has had a long and successful career that includes serving as the Dean of the UIS College of Business and Management since 2002. 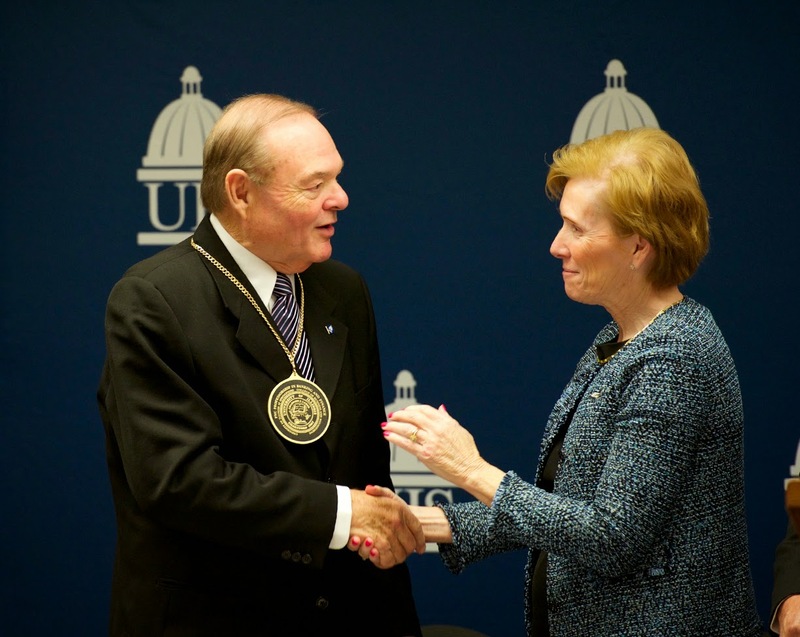 I have especially appreciated Dr. McNeil’s understanding of the importance of internationalization on the UIS campus. He has been a champion for the recruitment of international students as well as for study abroad opportunities for American students. He has also led the College to a successful outcome of its AACSB reaccreditation process as well as substantially increased enrollment in the College. Thanks to the support of PNC bank, this professorship will enable Dr. McNeil to expand his efforts for the benefit of UIS even further. It was a pleasure to see so many members of Ron’s family at the ceremony to celebrate with him. Congratulations, Dean McNeil!